← Who’s Driving the Bus? Last week, my good friend Stefanie Lightman and I blogged about the expression “bus driver” to better describe the all-important project leader. Evidently, political cartoonist Jeff Stahler agrees with us based on his political cartoon today describing Ohio’s newly elected governor. In researching our piece on bus drivers, I stumbled upon www.urbandictionary.com which has some very funny but NSFW expressions. That triggered some more thoughts about SFW metaphors and expressions that creep into our (my) business language. Here are a few that make me smile. 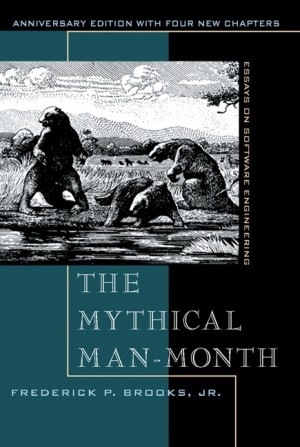 Fred Brooks could have titled his famous book, “Nine Women Can’t Have a Baby in a Month”, instead of the “Mythical Man Month”. As much as we may be tempted to correct the zealousness of software engineers, product managers and marketers, there is this thing called a critical path whereby adding more people to a project won’t make it go any faster. I guess there are only so many seats on that bus. “The dead moose on the table.” I’ve only heard this expression in Canada. Here in Ohio, and I think in the rest of the world, the equivalent expression for an “awkward meeting topic” is “Elephant in the room”. I’m curious why the Canadians felt the need to localize this expression. Just like Canada, we don’t have elephants in Ohio, but that didn’t compel us to localize this expression to “The flattened deer on the side of the road” just to work in an indigenous animal. “Bob’s Your Uncle” is an expression I heard used as a concluding remark after a passionate speech. My first thought was “But I don’t have an uncle named Bob.” I didn’t admit at the time that I had no clue what this meant, so after the meeting, I looked it up and learned that this expression is used in all the commonwealth countries. It seems the more common equivalent is “I rest my case”. I learned “I turn in to a pumpkin in one hour” from my former colleague George Florentine. It is a great way to tell your colleagues that they better finish their business with you in one hour because you aren’t hanging around even if they have more to discuss or say. “I am cornfused” is an expression I recall from a high-school coach and teacher. Most people just think you’re illiterate and cannot pronounce the word “confused”. “Ping me” is another common expression that means contact me via any means possible – email, txting, mobile, or yelling out the window. It has its roots both as a network test between two computers and in sonar detection in naval warfare. “Just sayin” seems to get lots of use lately. Add this to the end of all your highly offensive or insulting remarks to take the edge off. Feel free to share any of your favorites that I’ve missed. SFW only please! I like the “dead moose” on the table expression. About fifteen years ago, I remember Richard Kinder (then at Enron, now CEO of Kinder-Morgan) using a similar, local Texas expression which involved an alligator on the table. The meaning was different however. Whereas the elephant in the room and apparently the dead moose on the table are awkward subjects everyone knows but avoids, the alligator on the table was something that needed to be wrestled, or more regionally, “wrassled.” I assumed the alligator was a metaphor for a knotty, complex problem. I wonder what shows up on the conference room table in Australia or South Africa? Thanks Bob. The equivalent might be “alligators up to my elbows” but that implies lots of challenges, not just one. I’ve also heard other body parts substituted for elbows. I think I use “Wrestle to the ground” a bit – but never “wrassled”…only Texans can say “wrassled”.